Pre-cleaned, equivalent to 218 grade of GE, ready for use. All 99.95% pure. Malleable indium is recommended for static seals in very high vacuum systems. Indium also produces excellent evaporated coatings. These are used in the physical sciences, including for the production of efficient, tarnish resistant mirrors and as a low melting point solder, using pure indium or alloyed. These wires are produced to 99.999% purity and guaranteed to be no less than 99.99% pure indium. Indium: At. wt. 114.82; at. no. 49; m.p. 156.6 degrees C; b.p. 2080 degrees C; sp. gr. 7.31; valence 1,2 or 3. For practical considerations indium is non‐toxic. Indium is used as a sealant to bond non‐wetting surfaces. Using a compression seal made from indium, one can join glass, ceramics and metals. 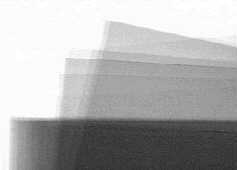 Compression breaks the oxide layer and creates a bond between indium and substrate. Indium seals are especially useful where low temperatures and physical vibrations are concerns. Cryogenic and high vacuum environments are areas where indium seals have become an essential component of the manufacturing process. Indium is favoured in high vacuum electron microscope vacuum seals since the material perfectly moulds into existing surfaces and forms a tight, but easily broken and renewed bond in static positions. The seal remains perfect up to the melting point of indium ‐ which is greater than the vacuum‐bake temperature in these systems. Outgassing is very low and of a nature that does not impair instrument performance. For larger quantities ask for a quotation. Indium requirements for EM are small, but we can supply large commercial quantities at BEST prices. VIN15PD ‐ The PD suffixed 1.5mm indium wire is identical to the VIn15, except it was badly wound and therefore is marginal for vacuum sealing applications. Perfect though for evaporation and low temperature soldering. Prices are for indium wire now in stock. New stock would need to be priced on current cost. 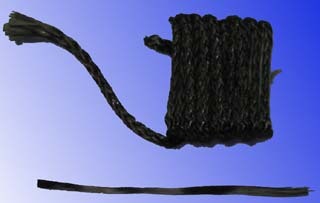 Orders for greater length will be supplied in one, at most 2 pieces. Nichrome wire for inoculating and other loops for laboratory use. 30 gauge/ 0.25mm and 0.6mm diameter. The wire is nominally 80 Ni and 20 Cr with very minor impurities except for 0.5% Mn. Resistance over 300mm is 6.2 Ohm for the 0.25mm wire and 1.2 Ohm for the 0.6mm wire. For carbon coating, these do not evaporate from a point and hence give more uniform coatings. Thickness may be changed by using one or several strings/yarns. Cord gives thicker coatings and is more suitable for dispersive analyses and self‐supporting carbon films. Coatings produced using only a rotary vane pump are grainy at high resolution, but they are satisfactory for conventional SEM and microanalyses. As a guide, one length of carbon fibre will give approximately 10nm, and two lengths 20nm. To use, twist the carbon fibre lightly together and place between the sprung electrodes, trimming any surplus. V004 and V005 are higher in carbon versus graphite, V006 has more graphite, which changes evaporation parameters as would its greater density. Carbon's melting and sublimation points: ~3550°C; boiling point is 4200°C; evaporation temp (at which a substance has a vapour pressure of 1.33 x 10-2 mbar): 2400°C. This is a simple hand tool for shaping carbon rods into cylindrical tips about two millimeter in diameter. About 4mm of such a cylinder are great for the production of carbon films in an evaporator. The rod is inserted into the tool and rotated by hand against an adjustable tungsten carbide cutter until a cylinder of the desired length is formed. Prior to cutting the rod with a small cylinder tip, the rods must be sharpened using an office pencil sharpener. The sharpener should be used for that purpose only. The cutting blade cuts into the side of the rotated rod and cannot cut into the end of a flat rod. See also Quorum Technologies' manual carbon rod shaper and an electric carbon/graphite rod shaping tool. 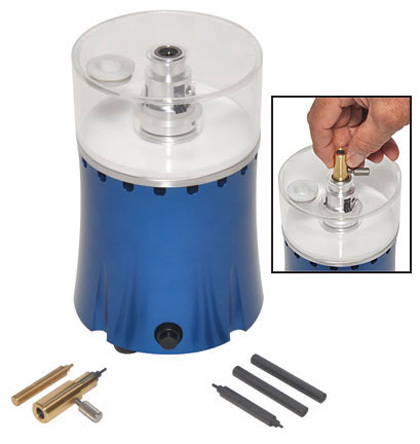 The easiShaper™ is an electric motor driven carbon rod sharpener which offers easy, quick and clean carbon rod shaping for carbon evaporators which are using either 6.3mm, 3.1mm or 4.75mm stepped carbon or graphite rods. The easiShaper™ produces more consistent, smooth and uniform carbon tips than any hand shaper. It is designed for cutting single and double stepped carbon rods. It is supplied to suit 6.3mm rods and the VP58-8 accessory is required for 3.1mm rods. The cutting head incorporates two tungsten carbide cutting blades, a top guiding bearing and vortex design to keep the carbon dust in the dust collector. A blade setting gauge is included to reliably set the cutting blades for a single step of 1mm or double steps with 1.65mm and 3.8mm. To set the cutter to produce 1.2mm cylinders, use the 1mm gauge and ease off a little before locking the cutter. Test cut and measure the resulting cylinder. The easiShaper™ carbon rod shaper is ideally suited for busy, multiple user labs, high throughput microprobe labs, and presents a clean alternative to hand rod shapers. The easiShaper™ carbon rod shaper includes a carbon rod holder for the common 6mm carbon rods. Additional holders for 3mm and 4.75mm carbon rods are available as an option. The carbon rod holder holds the carbon rod and is inserted in the top guiding bearing to produce precision cut tips. The integrated carbon dust collector is easily removed for cleaning and/or blade adjustment. The vertical design of the unit makes operation easy and saves valuable space. Universal power supply for 100-240V and 50/60Hz. UL listed and CE certified. 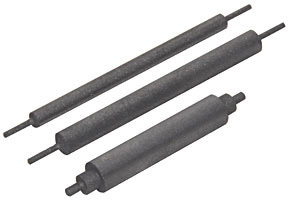 See also Quorum Technologies' manual carbon rod shaper and generic manual carbon/graphite rod shaping tools. These are well suited for heat cleaning of molybdenum or tantalum apertures and the evaporation of powders. To clean apertures: pre-clean aperture in solvent (chloroform). Place aperture in boat and bring to 10-4 pascal. Heat for 5 minutes to cherry-red only. Leave to cool prior to venting. Thickness 0.05mm, total length 75mm. Trough: 12mm long x 6mm wide x 1mm deep, pk/5. 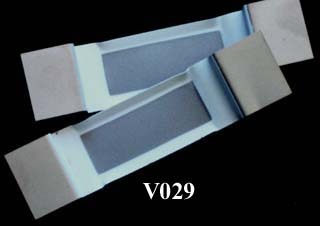 V028 and V029 are a combination of the refractory metal tungsten and an alumina barrier (Al2O3) coating over the tab area. The exposed metal area comprising the bottom of the boat allows the sample to be in good thermal contact with the source. The barrier will tend to help concentrate the heat towards the center. The alumina barrier will inhibit an evaporant (if used as a sample instead of an aperture) from creeping toward the heat sink or from wetting the entire boat. V028: Boat 82.5 x 12.7mm, trough 19 x 6.3 x 2.4mm deep. V039: Boat 101.6 x 25.4mm, trough 44.5 x 16 x 2.4mm deep. V030 replaces alumina crucibles for some specific applications. Good heat transfer yet has alumina inertness. Evaporant does not wet the alumina: no resistant change of the boat when evaporant melts. Due to the non-wetting characteristic, the evaporant forms a sphere when melted, resulting in a point source. Boat 101.6 x 12.7mm, dimple Ø 12.7 x 3.2mm deep. Melting point of tungsten boats with coated Al2O3 tabs: 3422°C. Heavy duty, 8mm Ø x 10mm depth, 8 turns, overall length 110mm. 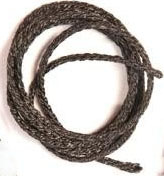 0.5mm Ø wire. 2/pkt. For self-made boats, for the evaporation of powders and heat cleaning of molybdenum and tungsten apertures. 150 x 150mm and 0.05mm thick. These sheets are available in two different plastics and three thicknesses. The material softens in Acetone and can be applied and gently pressed against a surface which was also wetted with acetone. Stripped off when dry, the replicas will hold a negative image of the replicated surface for inspection by scanning or light microscopy. For TEM a second replica made by the evaporation of carbon and metal will produce a high resolution positive replica. Smoother and finer detail replicas require thinner replicating film. So the Triphan is better suited to the reproduction of highly sculptured surfaces. Note: Cut pieces of film roughly rectangular (hold with tweezers), then snip off one corner (top right is the convention for notching sheet-films) Then place the film face down onto the surface to be replicated. Later, with the replica facing you, the cut corner will be in the top right position (or bottom left) and so you know which side is the replica. 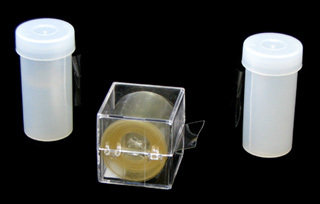 Cellulose acetate tapes soften in acetone and can be applied to a surface which has been wetted with acetone. They are stripped off when dry. A thickness of 22µm is used for finer detail replication. 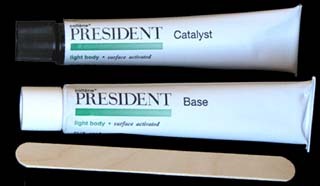 The President SEM replication kit is a two component silicone based moulding material with excellent low viscosity forming properties for high definition of fine structures. Polymerisation time is only 5-7 minutes and moulds can be removed from samples directly after polymerisation to obtain a negative mold. Applications can vary from replication of biological materials to achieve a stable surface or replication of processes like damage, wear or strain on large structures. The President replication kit can be used easily in the field and replaces the need to use fixative on suitable biological material. The silicone moulds can be filled with Spurrs to obtain a positive mould of the original surface and coated with Au or Au/Pd using a sputter coater. We advise to use Spurr since it has a low viscosity and provides excellent structure definition. President replication kit yields good results with relatively long 10-30µm microstructures with aspect ratios from 1-20, and is capable of resolving small structures down to 20nm. 53mL base, 53mL catalyst, 6 x 30mL mixing cups and 6 wooden stirring sticks. HOME \ V: VAC PUMPS, FITTINGS, WIRES, CARBON, TARG \ V1: WIRE, GRAPHITE/CARBON FIBRE/RODS, MOLY BOATS, SEM REPLICAT.